"Something has got to go, either my marriage, or my religion, I can't stand the constant conflict. . ."
These are hopeless statements from people filled with the despair that so often comes from the religiously mixed marriage. 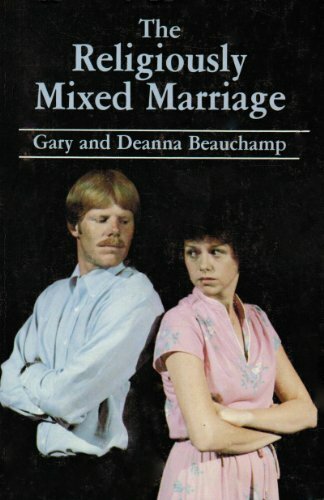 Gary and Deanna Beauchamp sensitively deal with this difficult problem which many couples face today. An excellent reference book for those with split religious affiliations or Athiest/Christian unions. Gary and Deanna (Kirk) Beauchamp are well-known for their involvement in the Lord's work at the Garland Church of Christ in Dallas, Texas. The Garland Church is the third congregation where Gary has preached that has doubled its size and tripled in contribution within a five year period. Deanna has been active as a writer of Bible school materials and several books and is an active interpreter for the deaf and teaches sign language. Both Gary and Deanna have B.A. and M.S. degrees from Abilene Christian Univesity and are currently teaching at the school's campus in Dallas. The Beauchamps have done extensive counseling with couples who have religiously mixed marriages and also with many single adults.